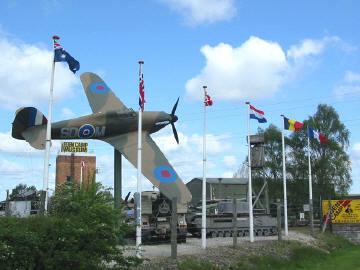 A museum of War Time Britain, where you can experience the sights, sounds, and even smells that were around during the second world war. It is based within a site which in 1942 was originally built as a prisoner of war camp for enemy prisoners. On display are reconstructed scenes using lighting, sound, smells, smoke machines, movement and lifelike exhibits to transport you back in time. They have an original Prisoner of War Camp built in 1942. All exhibits are housed in the huts which were originally built by the original prisoners held here and each one takes you on a journey telling the story of The Peoples War, a social history of life in Britain from 1939 to 1945. Each hut covering a different aspect of the story. As well as the indoor displays there is also a collection of military vehicles displayed around the site, a large collection of artillery pieces and a full size replica of a Spitfire and Hurricane aircraft as well as a V1 Doodlebug Flying bomb. On special event days you may also come across re-enactment teams with displays of Germ PoW's, British soldiers, an American M.P or even a British Bobby. Getting there: Located at the junction of A64 and the A169, just outside Malton. Access: Fully accessible for disabled visitors, there is not a single step. Free car parking for up to 400 cars. Opening Times: 10am to 5pm daily. Closes 23rd Dec to 14th January. Notes: They do not accept any Credit or Debit Cards. Dogs are allowed on site as long as they are kept on a lead. Other facilities include a cafe, children's play area and gift shop. Allow at least 3-4 hours for your visit.